Perennial, spreading by seed and rooting of stems. Forms a dense mat close to the ground. The very fine, grass-like leaves can be mistaken for a moss. Very invasive and a problem in close cut lawns, raise the mower to allow the grass to outgrow it. Watch out for it on the compost of new plants (discard the top few centimetres before planting). Seed can be spread while mowing and carried on soles of shoes. Has been suggested as a non-grass lawn, but unless you want complete garden coverage, avoid. Flowers from April to September, small bead-like buds. Four green sepals larger then the four white petals inside. Height - up to 5 cm, but usually more squat. Hand weed, regrowth from the roots is not a problem provided the growth point is removed, but it can be difficult to remove so with a large area it may be easier to slice off the surface. Small fragments can regrow. Remove at seedling stage if possible, but they are tiny like minature tufts of grass, so tedious to remove in number. It's difficult to tell the maturity of the seeds and hoeing can disperse them. A weed burner should destroy most of the plants and the seed. Paraquat, Diquat kill seedlings on contact, but more mature plants will require a systemic like Glyphosate. It will probably take more than one application due to the presence of seed. on paths a product containing a residual agent should prevent the seed from germinating for a while. On lawns a selective herbicide ( singular, or a weed-and-feed type ) will require a few applications due to persistence of seed. 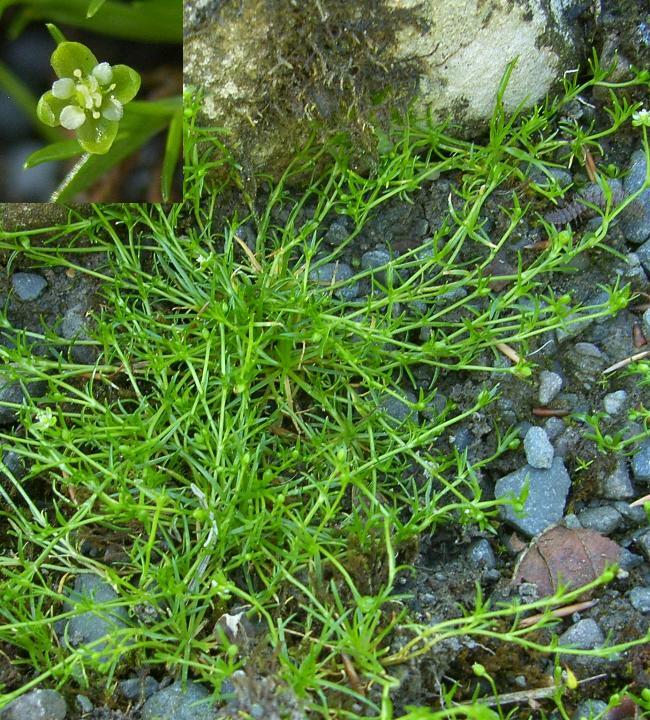 See also the monograph on Moss which is sometimes mistaken for Pearlwort.